The results included in this report are based on over 200 company submissions across Canada for the 2018 Spring Flash Survey between the months of April to June. The Wynford Group conducts FREE flash surveys every Spring and Fall to provide a snapshot on current compensation and human capital trends. The focus of this summary report is on salary increases implemented for 2018, as well as human capital management strategies currently in use across Canada. We hope that you find these results useful as your organization moves further into 2018. The Wynford Group encourages you to contact us for more information on how we can work with your organization in addressing totals rewards and compensation needs. 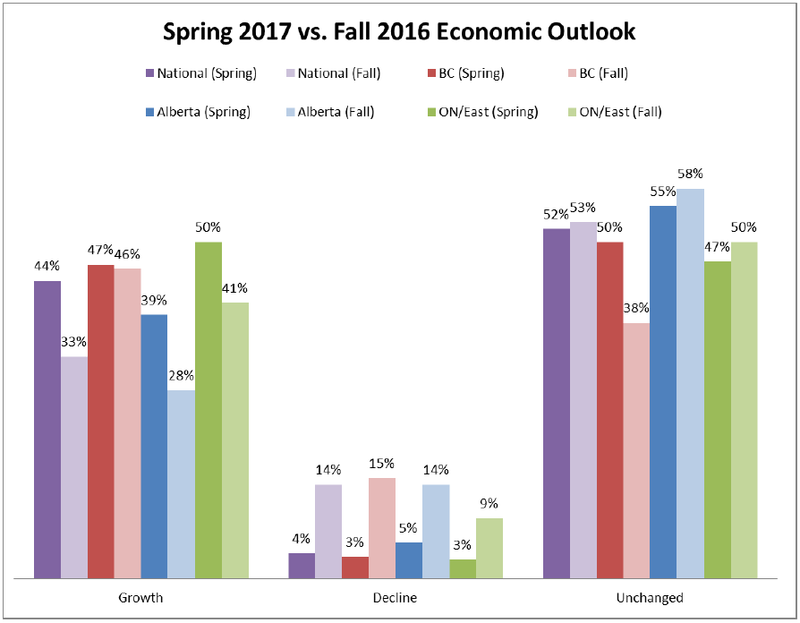 After overcoming the worst of the recession, the majority of Alberta participants have a positive view of growth for 2018 with 47% of organizations reporting they will experience economic growth in the year to come, representing a significant increase from 39% in the spring of 2017. British Columbia continues to lead the country in growth, showing a very optimistic outlook for 2018 of 65% expecting economic growth, an increase of nearly 21% of companies from the previous year. Overall, these figures indicate the economy is rebounding from the recession of the past few years. 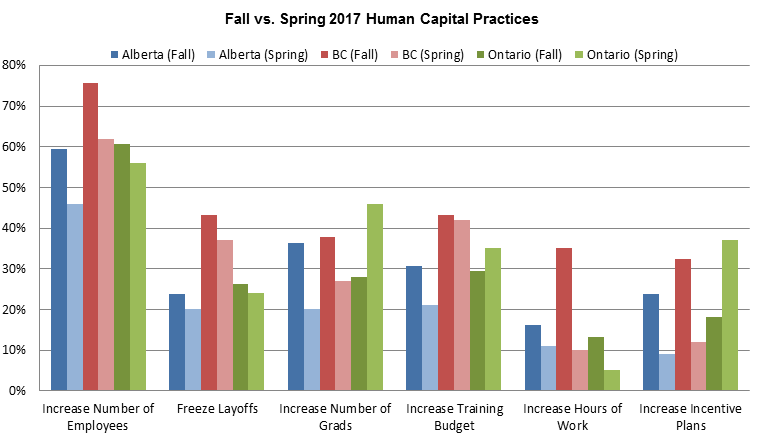 Helping to highlight the overall positive outlook of the Canadian economy for 2018 are the Human Capital Practices figures summarized in the graph above. Over 50% of Albertan organizations will be hiring in 2018, which represented the largest growth of more than 5% from the previous year. While both B.C. and Ontario indicate slight drops in employee growth, both still have over 50% of organizations in showing increases in their workforce numbers. The clear reduction in employment freezes and layoffs point towards strong economies across the country. Other positive figures such as increased hiring of graduates and increased training budgets in all areas. 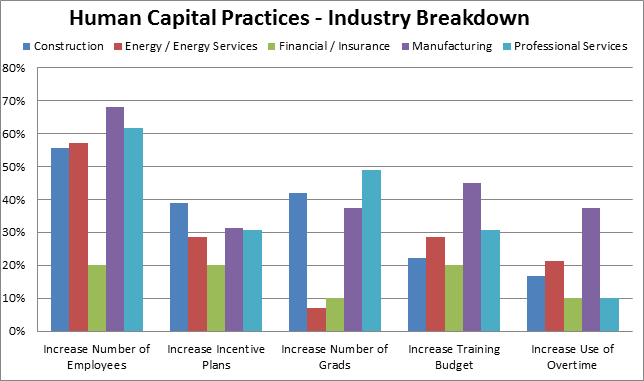 Of particular interest is the increase in training budgets and use of incentive plans in BC and Alberta, which indicates interest in longer-term retention strategies. While the Construction sector is not increasing the workforce as to the extent that they did in 2017, over 40% indicated they are increasing the number new graduates. Overall, it appears that those industries that were hit hardest by the economic downturn are showing strong increases in hiring back employees and new graduates over the previous two years. The significant increase in the use of overtime for the Manufacturing sector suggests expected growth in hiring and economic growth in that sector. The results included in this report are based on over 250 company submissions from across Canada between October and December. The focus of this summary report is on salary increases for 2018, as well as human capital management strategies currently in use in today's workplace. We hope that you find these results useful as your company moves forward into 2018. The Wynford Group encourages you to contact us for more information on how we can work with your organization in addressing its totals rewards and compensation needs. 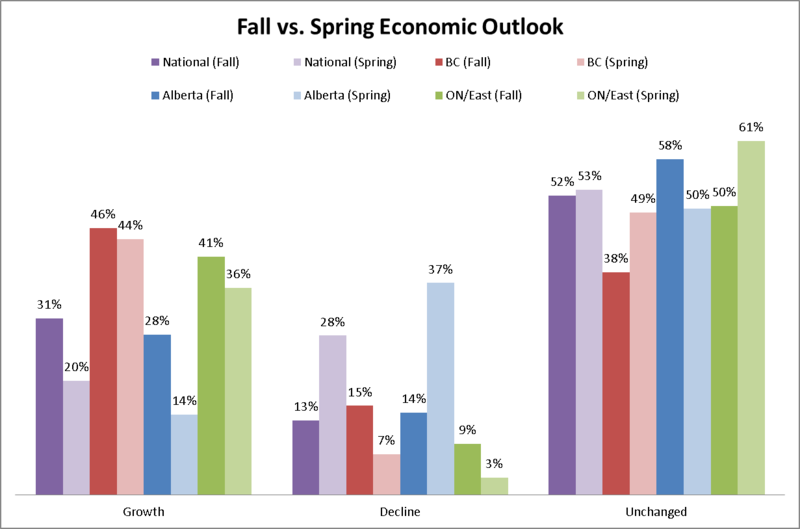 After being hard hit in the past few years of economic recession, the majority of Alberta participants have returned to a positive outlook of the economy for 2018. 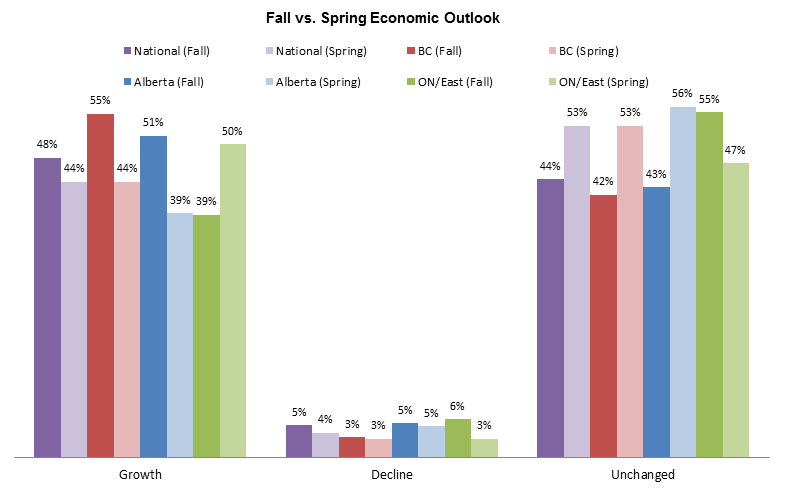 51% of organizations reporting from Alberta believe they will experience economic growth in the year to come, representing a significant increase of over 10% since the spring. 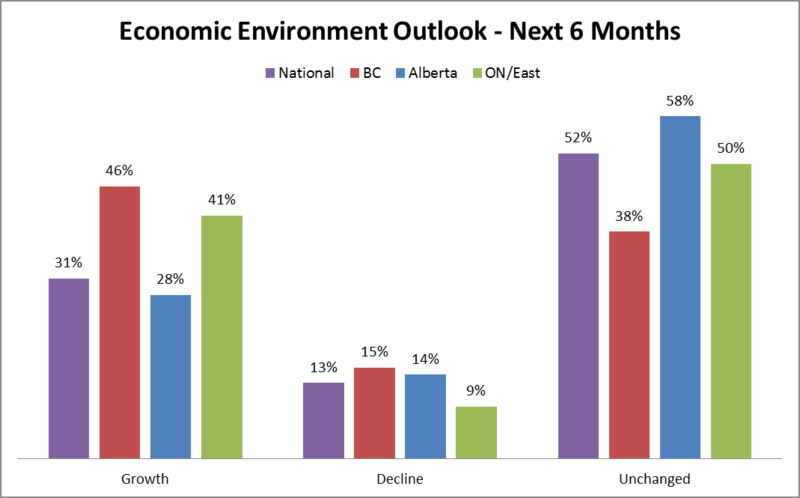 Similar to the increase seen in Alberta, participants in British Columbia continue to believe in positive economic growth for the upcoming year at the highest rate of 55%. Organizations reporting from Ontario have lowered their expectations for economic growth in the months to come. However, as there has been a significant increase in those expecting "no change" for 2018, we believe that sustained economic growth is likely for Ontario. 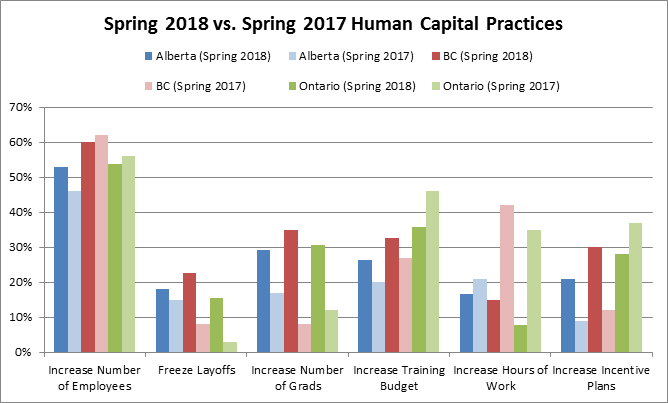 Helping to highlight the positive outlook of Alberta's economy for 2018 are the Human Capital Practices figures summarized in the graph above. Nearly 15% more Albertan organizations will be hiring in 2018, bringing the total to well over 50% of total participants. Other positive figures such as increased hiring of graduates, increased training budgets, and increased incentive programs all point towards a strong, rebounding Alberta economy. Similar trends can also be seen in the numbers for British Columbia & Ontario. Over 75% of participants reporting from B.C. will be looking to expand their workforce in 2018, while 60% of organizations in Ontario will be doing the same. Large increases in hours of work, and improvements made to incentive plans will help attract and retain key talent for these B.C organizations. A key function of this survey is not only to report on what organization's expect of the economy, but how they are dealing with these expectations in terms of their human capital. During the past few years we have seen a significant uptick in the use of cost saving practices by organizations in order to balance their books while maintaining bench strength. These practices varied in both size and severity throughout Canada and have left many individuals with reduced hours, wage freezes, or layoffs. Although we are beginning to see a reduction in policies such as these, many organizations are still employing cost saving strategies that impact the work force. These strategies are highlighted in the graph below. Many more participants are replacing current vacancies, rolling back wage freezes, and increasing the number of hours worked than were doing so during the spring of 2017. More than 75% of participants expect to replace future vacancies. Less than 20% of organizations have (or plan on) implementing wage freezes. Other cost saving strategies such as increased benefit cost sharing, increase unpaid vacation, and pay rollbacks are still being used, however, at a much lesser rate than previously reported. Averaging at 5% across the board, companies seem to be rolling back cost cutting measures with expectations of growth in 2018. We believe that these are all positive signs for the labor market, and the economy as a whole for 2018. The information presented in this report is a short sampling of results and interpretation of a survey submitted by over 200 participants from across Canada, compiled between April and June of 2017. The focus of the survey was on actual salary adjustments and impacts to compensation trends in 2017. We hope you find these results valuable, and encourage you to contact us for more information or to learn how the Wynford Group can work with your organization for any compensation or management consulting requirements. Analysts have boosted forecasts for the British Columbia economy, leading provincial growth at 3.0% for 2017. The Alberta economy is showing definite signs of recovery in 2017 with GDP expected to be 2.9% for 2017. This growth is expected to continue to a country leading 3.4% in 2018 when the recovery is expected to be in full swing. Ontario is following closely behind with growth of 2.7% expected for 2017. Atlantic Canada still faces hard times with economic forecasts suggesting low levels of growth, and even economic contractions. Forecasted for two more years of recession, Newfoundland & Labrador faces -2.2% for 2017 followed by -0.4% in 2018. Summarized in the graph below are our participant's expectations on how they see their businesses performing in the summer months of 2017. Overall, the results of these responses indicate a positive outlook for economic growth and maintained levels of business for the majority of participants. An increase of over 10% in organizations expecting growth since Fall 2016. With only 4% of participants expecting a decline in business, organizations seem to believe that the economic downturn is behind us. The most positive figure from this chart is the 11% increase in organizations reporting from Alberta that expect an increase in business. As Alberta's economy faced some of the worse consequences of the recent recession, it is encouraging to find that organizations are expecting growth at a higher level for 2017. We believe that these figures indicate a recovering economy, albeit a slow recovery with a long road ahead. 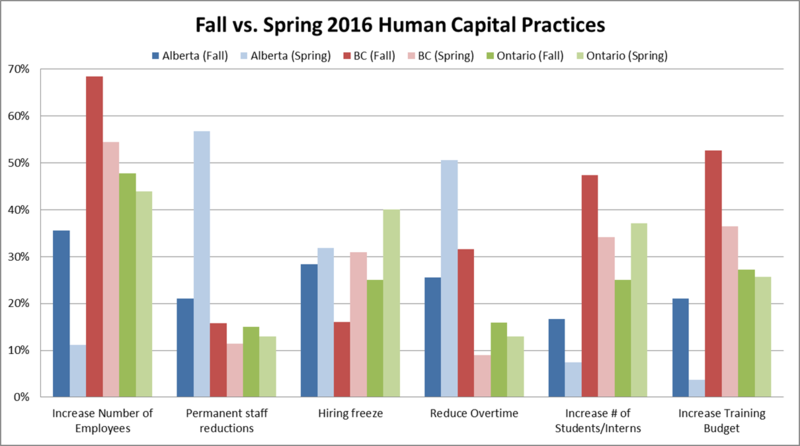 Human Capital Practices in Alberta are all trending in a positive direction - Number of employees and Interns are on the rise, fewer organizations are reducing overtime and implementing layoffs and variable pay such as incentive plans are beginning to rebound. The same practices in British Columbia are showing mixed results - fewer organizations expect an increase in staff than in the fall, and increases in training budgets and incentive plans have slowed. However, these levels are still far above those of Alberta and highlight the overall strength of BC's economy. Ontario practices are also trending in a positive direction - permanent staff reductions are at a lower level, restraints on overtime are being loosened, and organizations are increasing both permanent and temporary employees at a far greater rate than in Fall 2016. Increases in both training and use of interns are a strong lead indicator for Ontario in particular. The strong increase in incentives for Ontario may be another leading indicator of expectations for a continuing positive economic environment. 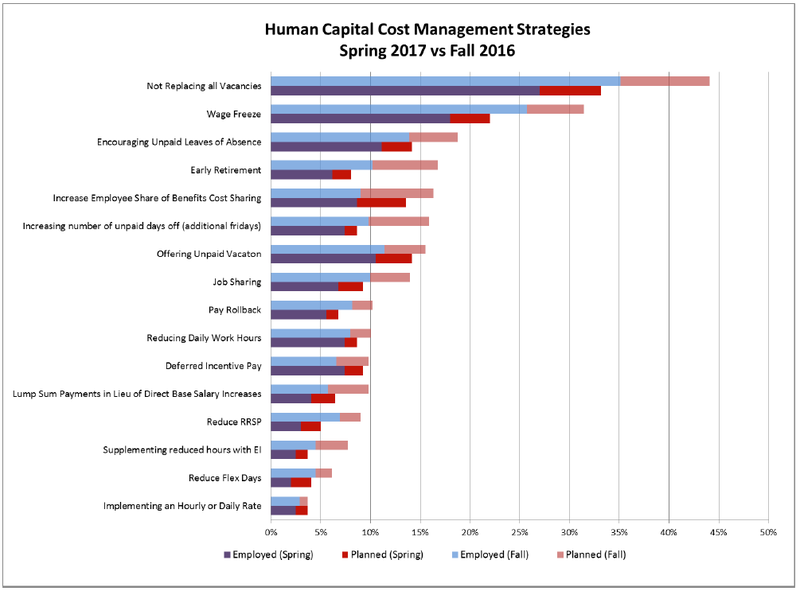 The graph above provides participants a summary of the cost management strategies currently being used in Canada to save on human capital. The figures above tell us a story of the market for labor, as well as the overall health of our participant organization's businesses. 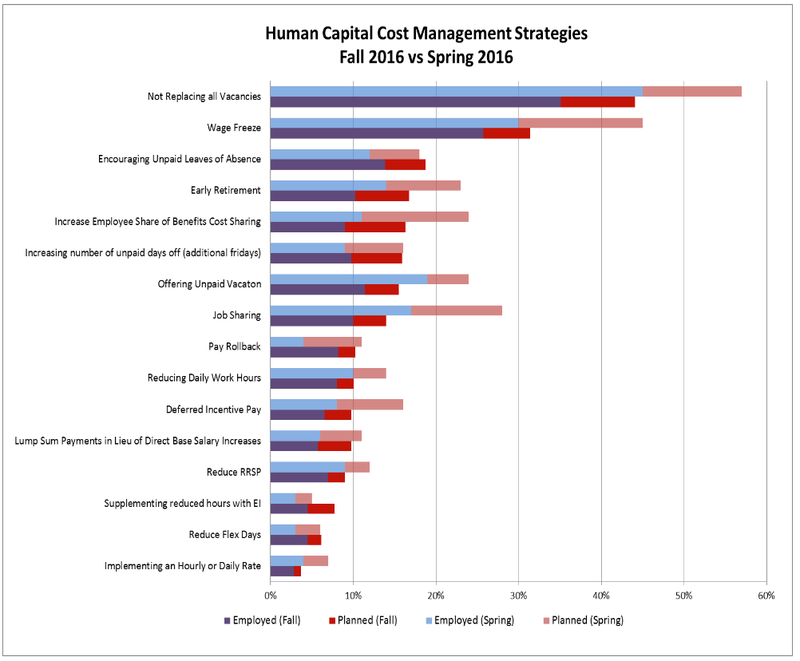 Since our previous Flash Survey in Fall 2016, all cost reducing strategies for human capital have decreased. Over 10% fewer organizations have implemented a wage freeze - dropping to below 20% of reporting organizations. The use of early retirement, unpaid days off, job & cost sharing have all decreased significantly since Fall 2016. The two most rescinded cost management strategies were "Wage Freeze" at 7%, and "Not replacing all Vacancies" at 5%. These all indicate that the recovery is on its way, but the severity of this last recession in the energy sectors has prompted many organizations to rethink their employee costs on a more permanent basis. Gail Evans recently presented some highlights from the Wynford Group?s salary projection survey completed in late 2017 with over 240 participants from across Canada. We are expecting these projections to be reflected in the actual survey responses being gathered now in our Canadian Salary Surveys. The chart below indicates that there has been a marked change in the confidence in the economy across the country. For Alberta, the flip is most dramatic: 14% increase in confidence of growth and a whopping 23% decrease in companies expecting a decline in business. This prediction is consistent with the recent Conference Board of Canada projection that Alberta will lead provinces in economic growth in 2017 to work towards recovery from the recession in the last 2 years and provide a more balanced narrative on the Canadian economy as a whole. With oil prices holding steady at around $55/bbl. and multiple pipeline projects being approved, oil producing provinces are beginning to show increased optimism for 2017. However, the labour market is expected to slowly strengthen rather than bounce back. British Columbia and Ontario are expected to see sustained growth in 2017; however, there is an expectation that these provinces will see slightly less growth than in the previous year due to the potential impact of new U.S. trade discussions and measures taken regarding the hot housing markets. *Please note that these figures include reported 0?s for base salary projection increases. The above indicates that the divergence in salary increases between industries is narrowing. In comparison to the Spring Flash Update, the difference between the highest and the lowest projected increases was over 5.5%, while the Fall difference is only 1.17%. The Wynford Group attributes this to the slow bounce back in the energy sector, as well as a leveling out in some industries such as software development and mining. When emerging from a recession, one of the slowest areas of the economy to catch up is often the labour market. Typically lagging behind as investor confidence and company revenues rebound, positive movement in the labour market is a harbinger of better times ahead. Since spring 2016, nearly 25% more companies expect to increase their number of employees in Alberta ? while 36% less companies expect to make permanent layoffs. Nearly 70% of participants responding from British Columbia expect to increase their number of employees. The instances of hiring freezes have dropped, yet a number of organizations are maintaining this strategy, therefore indicating that caution is still in place. Many organizations that were hard hit by the recession chose some innovative ways to reduce costs yet maintain ?bench strength? of skilled workers. The chart above indicates that the majority of these were implemented in Spring 2016 and fewer organizations were looking at these approach by late Fall 2016. More than 55% of participants expect to replace future vacancies. Only approximately 30% of organizations have, or plan on implementing a wage freeze in 2017. Drops in job sharing, early retirement, unpaid vacations, and deferred incentive pay indicate that employers are loosening budget constraints for the coming year. We project that there will be quite a different picture in Spring of 2017, when companies who had rolled back salaries are expected to start reversing that strategy. We also believe that we are entering a period when Flexibility in responding to economic and other issues will be critical in fine-tuning Total Rewards strategies in the immediate future. The information presented in this report is a summary of results and interpretation of a survey completed by over 240 participants from across Canada, compiled between October and December of 2016. The focus of the survey was on actual salary adjustments and impacts to compensation trends in 2017. We hope you find these results valuable, and encourage you to contact us for more information or to learn how the Wynford Group can work with your organization for any compensation or management consulting requirements. For more detailed insights and in-depth data, please see our annual Canadian Salary Surveys. Please click here for more information. Needless to say, 2016 was a year of uncertainty for most Canadians. With scattered layoffs throughout the country, the majority of Canadian provinces experienced increased unemployment rates carrying over from 2015. As a particularly negative benchmark for 2016, Alberta saw its highest unemployment rate in 22 years at 9.0% in November. Although provinces such as British Columbia and Ontario managed to weather the storm, we look towards 2017 for a brighter and more balanced narrative on the Canadian economy as a whole. With oil prices holding steady at around $55/bbl. and multiple pipeline projects being approved, oil producing provinces are beginning to show increased optimism for 2017. However, the labour market is expected to slowly strengthen rather than bounce back entirely. British Columbia and Ontario are expected to see sustained growth in 2017; however, there is an expectation amongst Economists that these provinces will see slightly less growth than in the previous year due to new regulations on their provincial housing markets. Summarized in the graph below are our participant's expectations on how they see their businesses performing in 2017. An 11% increase in organizations expecting growth in 2017. A decrease of 15% of participants expecting decline. The majority of participants; 52% believe that their organizations will remain steady through the first half of 2017. 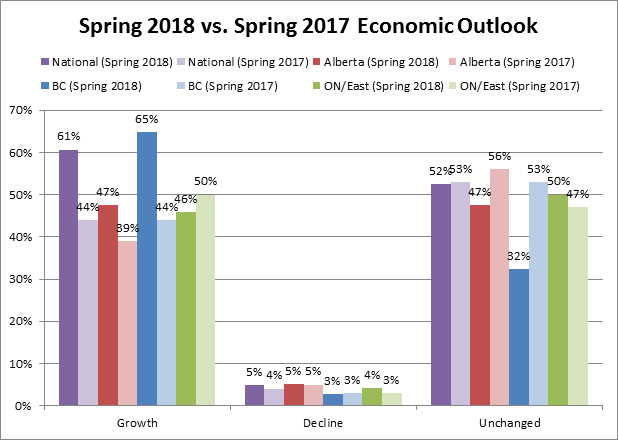 For Alberta the flip is more dramatic; 14% increase in confidence of growth and a whopping 23% decrease in companies expecting a decline in business. Overall our participants are forecasting a better year for business in 2017. Although there will always be areas of uncertainty; whether it be domestic government policy, political change in the United States, or the ever-frustrating actions of OPEC, our economy is moving forward and optimism on the rise. The above indicates that the divergence in salary increases between industries is narrowing. In comparison to the Spring Flash Update, the difference between the highest and the lowest projected increases was over 5.5%, while the Fall difference is only 1.17%. The Wynford Group attributes this to the slow bounce back in the energy sector, as well as a leveling out between industries such as software development and mining. *Please note that these figures include reported 0's for base salary projection increases. Since spring 2016, nearly 25% more companies expect to increase their number of employees in Alberta while 36% less companies expect to make permanent layoffs. Increases in the use of interns and training programs are strong lead indictors of confidence in the economy as well as expectations for increased labour requirements. A key function of this survey is not only to report on what organizations expect of the economy, but how they are dealing with these expectations in terms of their human capital. During 2015-2016 we saw a significant uptick in the use of cost saving practices by organizations in order to balance their books while maintaining bench strength. These practices varied in both size and severity throughout Canada and have left many individuals with reduced hours, wage freezes, or layoffs. The Wynford Group aims to provide employers options to explore regarding human capital cost savings. For several years we have asked participants which of the following cost saving strategies they currently have in place, or plan on using in the coming months. Below is a graph of these results. 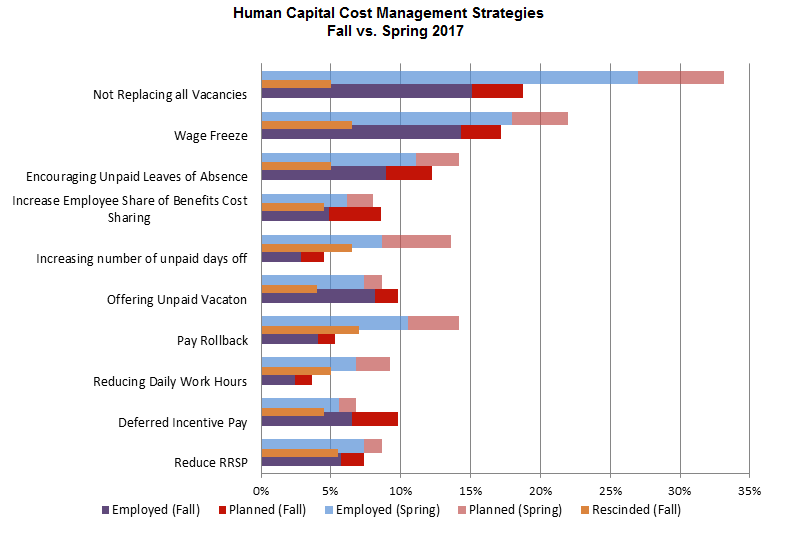 As can be seen in the results above, participants responded in the spring of 2016 as having implemented these cost saving strategies at a much higher rate. Not replacing all vacancies is a simple but effective strategy that the majority of participants have implemented in the past year. However, these figures have decreased since. In line with both our Economic Environment figures and our Salary Adjustment statistics below, this graph follows the same narrative of analysts and government officials alike; it seems as though the worst has passed.